Simple, elegant and classic; each of these are a characteristic wanted when looking for a captivating piece of jewellery. 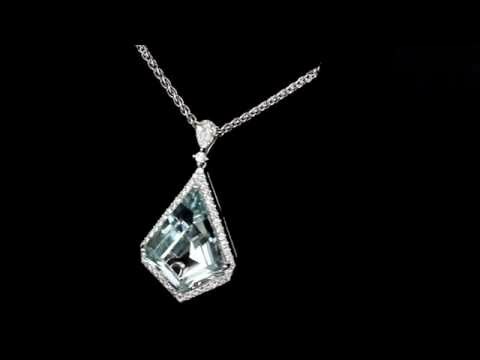 This gorgeous aquamarine and diamond pendant has been flawlessly crafted out of 18 carat white gold and sits perfectly on a 16 inch chain. The chain is met seamlessly by a single pear cut diamond which is held within a three claw setting along with a pairing brilliant cut diamond delicately placed below it. These two introductory diamonds then graduate to a collection of G/H coloured brilliant cut diamonds which cluster the aquamarine gem. The centre piece of this pendant is its 8.93 carat aquamarine which has been finished with a truly unique cut which simply emphasises the stone. The diamonds glisten alongside the exquisite colour of the centre gem to make this a show stopping piece. Not only is this pendant flawlessly stunning the detail behind the setting shows the high quality craftsmanship and unique design of this piece. If you should have any further questions regarding this aquamarine and diamond pendant then please do not hesitate to contact us.